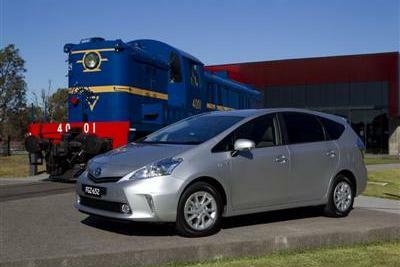 Toyota has expanded the line-up of cars wearing the Prius nameplate with the arrival of the seven-seat Prius V.
Prius now becomes the first full hybrid vehicle available as a standalone model range, with Prius V joining the Prius C and the well known Prius hatch. Newly designed from the ground up, Prius V is longer, wider and taller than a standard Prius with an extended wheelbase, making it possible to accommodate adults in all three seating rows. The Toyota Prius V is priced from $35,990* with advanced features including a 6.1-inch display-screen audio system, automatic air-conditioning, 16-inch alloy wheels, energy monitor, head-up display, keyless entry and ignition, daytime-sensing headlamps, electric power steering, cruise control and daytime running lamps. Prius V showcases the latest generation of Toyota's Hybrid Synergy Drive® powertrain, which employs a 1.8-litre Atkinson cycle petrol engine and a powerful 60 kW electric motor for a combined system output of 100 kW. Supported by low weight and strong aerodynamic performance, Prius V returns class-leading fuel economy of 4.4 litres/100 km and CO2 emissions of 101 g/km**. "We see Prius V as an alternative to small or mid-size sedans and wagons as well as compact SUVs and cross-over vehicles - with fuel economy few of them can match," he said. "With the added cargo space, the Prius V might also make an ideal light delivery vehicle for florists and small-package delivery services." 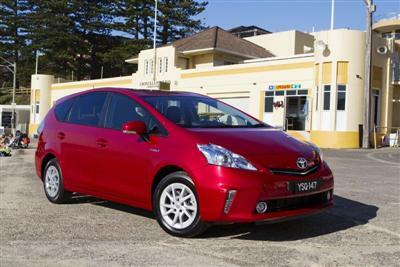 Toyota now has a version of the Prius range to suit a diverse range of buyers, lifestyles and budgets. Prius V pricing sits at the top of the Prius range with the Prius C city car starting at $23,990*, the Prius hatch from $33,990* and the new Prius V priced from $35,990*. The new car's seven-seat format features three independent sliding, reclining and split-folding second-row seats and a 50:50 split-folding third tier, providing a huge range of seating and cargo-carrying combinations. Each row of seats is raised slightly above than the one in front, providing clear forward visibility for all occupants while maintaining ample head clearance and legroom throughout. 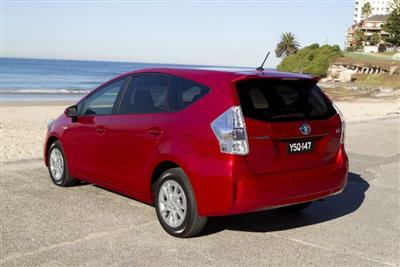 Even with seven occupants on board, the Prius V provides 180 litres of cargo space. Stowing the third row of seats provides a flat luggage floor with a capacity of 485 litres. Like the Prius hatch, there are three "on-demand" drive modes to increase the capabilities of the full hybrid powertrain. EV mode allows for ultra-quiet running on electric motor power alone for up to two kilometres, resulting in zero fuel consumption and emissions. Eco mode prioritises fuel economy by slightly damping throttle response and limiting power consumption from the air-conditioning system. Power mode boosts system performance. 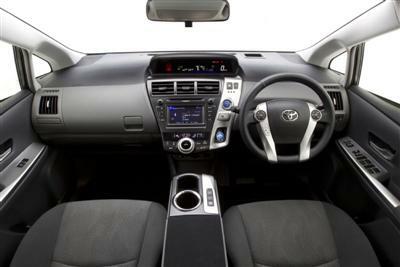 Prius V, like all new Toyota vehicles, is covered by Toyota Service Advantage with a capped price of $130 for each of up to six scheduled log book services in the first three years or 60,000 km#. ** Fuel consumption and emissions data will vary depending on driving conditions/style, vehicle conditions and options/accessories. Source of data: ADR 81/02. # Maximum payable for standard scheduled servicing (normal operating conditions) until first of 3 years or 60,000 kms (up to the first 6 services). Excludes government owned and rental vehicles. Conditions apply.